The Werner Fiberglass A-Frame Step Ladders are extra heavy-duty professional grade ladders, yet will work for anyone who just needs a little extra reach. 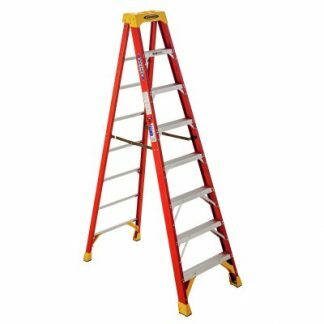 Our step ladders are made of strong, lightweight, easy-to-handle, non-conductive fiberglass, and are ideal for people working with electricity. Werner step ladders feature double-riveted construction, slip-resistant 3″ traction steps, and oversized rubber feet to ensure a safe climb and sturdy support. Working off the ground comes with challenges and to help keep you safe and your tools organized, Werner has integrated a holster-top to allow quick and easy access to things you may need atop the ladder. 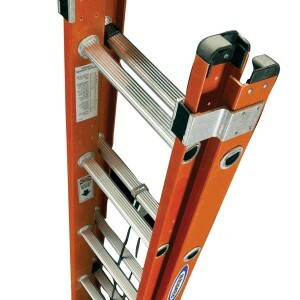 Step ladders are available to rent in 10′ and or 12′ heights.